Hillary Clinton’s proposal to spend $350 billion on “affordable” tuition may have been outrageous, but at least it provoked some poignant comments on the pitfalls of big government. It seems like a phony issue for the a struggling Obama administration to be promoting – the allegations that the U.S. Chamber of Commerce may or may not be using foreign contributions to fuel political ads against Democrats. However, President Barack Obama would be best advised to make sure his party wasn’t doing something similar before using the bully pulpit to push this meme. On CNBC’s Oct. 11 broadcast of “Power Lunch,” CNBC Washington correspondent Eamon Javers laid out the latest ramped up attacks on the U.S. Chamber of Commerce from the president. What is it with Hollywood personalities going to Venezuela and being swept off their feet by the thuggish dictator Hugo Chávez. They come back with these stories claiming he is just misconstrued by the media and that he’s really a great guy. On Oct. 7, at an appearance at the Cato Institute in Washington, D.C. promoting her book “You Know I'm Right: More Prosperity, Less Government,” the proudly libertarian co-host of CNBC's “Power Lunch” Michelle Caruso-Cabrera explained how this could happen. She told an audience that Chávez has a very charismatic, yet seductive personality. The Twitter "Fail Whale": An irritating part of anyone's day that regularly uses social networking in their day-to-day activities. But could this endanger the viability of Twitter as long-term business? A couple of analysts say think so. Both CNET.com senior editor Natali Del Conte and Herb Greenburg of CNBC Business News suggested Twitter's infrastructure problems could pose issues for Twitter's survival on CNBC's July 2 "Power Lunch." "Twitter's down all the time," Greenburg said. "I love using Twitter. I will say it here and now - if Twitter were a business, it would be broke. Wait! Twitter is a business, but it's a private business. Maybe it's the type of business that should go public in this environment because those are the kind of companies that go public. You have to hand it to Dylan Ratigan. The MSNBC bloviator melded immigration reform, the military industrial complex, and congressional gridlock into a scatter-brained diatribe at the top of his eponymous program on Thursday. 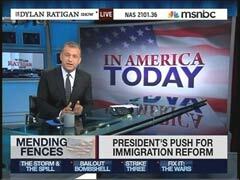 In the wake of President Barack Obama's speech on immigration reform earlier in the day, Ratigan railed against "Arizona's latest anti-immigration law" and praised Obama for "doing a good job, and a better job than almost any politician I've seen in a long time, in drawing our nation's attention to the major broken systems in this country." The former CNBC anchor who fancies himself a financial guru also babbled about a "War on Drugs that feeds money into the military complex but does nothing to defeat drug use or, for that matter, protect the border." Then, interviewing Rep. Xavier Becerra (D-Calif.), Ratigan excoriated a Senate full of "weasels" that perpetuates an "utterly frozen process that allows the special interests to destroy our country and freeze our government." Just one day after Treasury Secretary Timothy Geithner said the U.S. wouldn't lose its "top-notch" credit rating, one CNBC guest said that ‘"all governments" will default - it's only a matter of time. When asked by "Power Lunch" co-anchor Sue Herera if he would buy Greek debt, Marc Faber said: "No, I'm not interested in government or sovereign debts because I think that all governments will eventually default, including the U.S."
Shocked, Herera replied, "What! Whoa, whoa, whoa." Co-anchor Dennis Kneale asked for clarification, "All governments?" "Mhmm. All governments," Faber, editor of the Gloom, Boom & Doom Report, explained. "Some like Singapore that have basically no government debt and have huge reserves ... in general the problem is the emerging economies today are financially much sounder in terms of debt to GDP than the developed world, including the U.S., Western Europe, the U.K. and so forth. Media Oversight: Is GM Stakeholder Federal Government Playing Politics with Toyota Recall? The government's traditionally enforced safety standards on automobiles sold in the United States. But the government didn't always own a car company. So you'd expect the media to take a hard look when the government's roles as regulator and competitor converge. But unless you saw the Jan. 28 broadcast of CNBC's "Power Lunch," you might not realize that this is exactly what has happened. In an interview with CNBC "Power Lunch" co-host Michelle Caruso-Cabrera, Sen. Jeff Sessions, R-Ala., was asked about the Toyota recall, which involves 2.3 million vehicles since a Toyota manufacturing facility had recently located in Alabama. "We've got a fabulous Toyota engine plant in Alabama," Sessions replied. "They've been doing very well. It seems that they've recognized they're going to fix this problem and it's going to take some effort." Want to make a big splash to bolster your chances in a political campaign? A tried and true strategy for some attorneys general has been to champion a populist position by exploiting the legal system for publicity. Just look at the lead up to the launch of former New York AG Eliot Spitzer gubernatorial campaign with his attacks on Wall Street. And that appears to be the playbook California Attorney General Jerry Brown is using in a lawsuit accusing State Street (NYSE:STT) of cheating the state's two largest pension funds, the California Public Employees' Retirement System and the California State Teachers' Retirement System, of at least $56.6 million. However, CNBC's Michele Caruso-Cabrera wasn't afraid to ask Brown if that was indeed the case in an Oct. 20 interview on CNBC's "Power Lunch."